One Apple fan didn’t take kindly to the office message of “PLEASE DO NOT PRINT LARGE JOBS” (all in caps of course!) and decided to take on the note quite literally, printing an enormous rasterbatored image of the classic Steve Jobs portrait. The original message was obviously aimed at preventing ginormous print jobs that hog printer queues office-folk are all too familiar with. 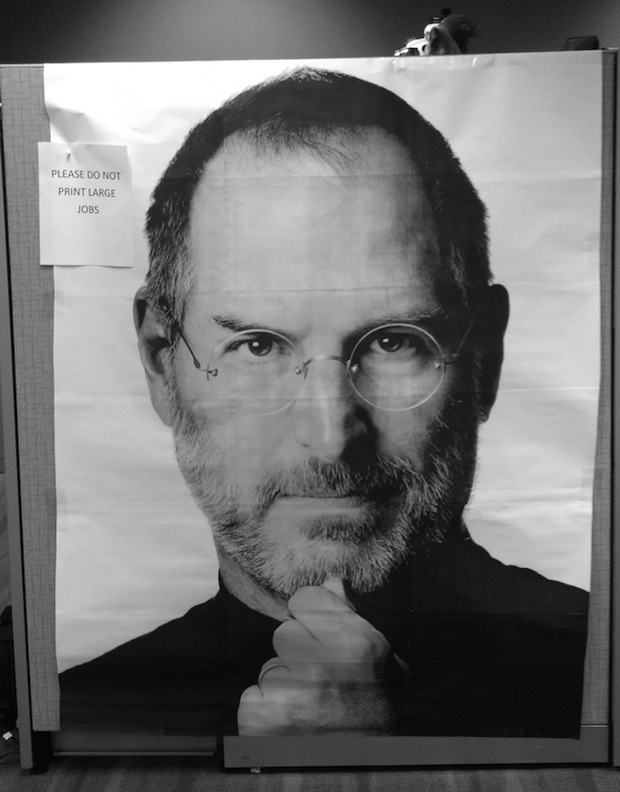 This is completely stupid, but this is office rebellion and humor at its finest with an Apple twist, and though it probably belongs on Passive Aggressive Notes more than here, it’s too funny to ignore for a Friday. Oh and if you want to recreate this yourself, well, you can try the Rasterbator thing we mentioned above, or you know, if your printer is broken you can do this totally stupid thing instead with a lot of dedication, you just may be able to recreate that masterpiece. And there’s no denying the picture of Steve Jobs is great (it’s the cover of his biography from Walter Isaacson, if you didn’t know that already), and it does make good wall art, if you’re a big Apple fan anyway… hmm! Maybe someone should make a real poster? Anyway, this is a very amusing find from Buzzfeed. Hahah! Good joke but I actually kinda want one of these for my wall is that weird? I remember printing a poster like this with the original Mac and ImageWriter. My workgroup had bought this scanner dohickey that snapped into the ribbon cartridge position in the ImageWriter. It contained an optical reader at the print head position. Software that came with it controlled horizontal motion of the printer carriage and vertical motion by rolling the platen. We took the resulting image and blew it up as a multiple page print, I think it was down with MacDraw, printing it with the same ImageWriter, this time with the ribbon cartridge installed. Alas, the subject wasn’t SJ but rather one of my scarier looking colleagues. Also, since the original Mac was only black or white, no gray, the image was very pixelated. So you had to view it at a distance. Someone put it on the wall you faced as you came up the stairs. It would give you a start if you hadn’t seen it before. Made me think of Chuck Close paintings for some reason.